Most of the ideas in this post have been stolen from Marcio Dupont’s blog on May 1, 2014. 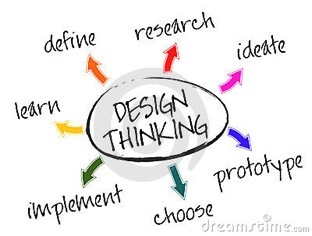 Design Thinking has become a bit of a craze in both Business Schools and companies. But design work is more than design thinking. Design work involves two activities, the creative ideas and insights activity and the practical, turn-it-into-reality activity. Design Thinking is really helpful in the creative activity – but it does not do much to help you turn it into reality. The chart above has “choose” and “implement”, but design thinking does not focus on these steps. For good design, according to Marcio, you need Design Thinking and a Designer: by this he means someone who takes the hard and practical decisions, mobilizes others, leads the project and brings out a workable result. Another way of expressing this is that for good design we need a Design Thinker and a Design Producer (or Design Director). “Many businesses and schools have a belief that good design thinking will solve all the problems of a global company in several areas from design, engineering to management. Nowadays, companies want innovative solutions quickly and at low cost, and it seems that somehow, design thinking is seen as the solution. The expensive, complex and time consuming processes demanded by “traditional” design work, have been transformed into a cheap, fast and without major complexities process within design thinking. I have edited a little because the original is in Portuguese – no I don’t read Portuguese, but was working from a translation. Marcio goes over the top here. Design Thinking is much more than a cheap, fast process. But he also has a point. It is easy to put the design thinking bit of the design process on a pedestal, and believe that, if you do this well, you will come out with a good design. So what is Design Thinking? It includes “going to Gemba”, going to the places where the value is being created – the production line, the sales interaction, the customer usage moment – and observing what is happening. It includes laying out customer journeys or supplier journeys or employee journeys to understand how people arrive and leave these “moments of truth” (P&G phrase). It includes deep interviews to understand motivations, values and philosophies. It includes mock-ups and trials and role plays and three-D printing of models. And what is Design Direction or Design Production? Design Direction includes project management. It includes agreeing plans and budgets with the sponsor client. It includes working up good “design principles”. It includes evaluating ideas against design principles and against other tests of practicality. It includes destruction testing. It includes a deep knowledge of the technologies needed to make the design work. It includes making tough decisions and compromises. It includes organising people and sub-contractors to meet deadlines. You need both for a good design outcome. This entry was posted in Design steps and tagged design process, design thinking, gemba. Bookmark the permalink. Andrew – very fine points indeed regarding the notion of design oriented approaches. I gotta have a wry smile though because the socio-technical systems stuff that was around in the 70’s and 80’s reminded us all about the importance of user input and allocation of design choices, etc. I think there is a very important point here about time. As design cycles mature, the degrees of freedom to influence decisions lessen. That means that if one values user and customer insights then ways must be found to access those early in the process. This can be a vexed issue, especially where ‘technology or expert led’ processes gathera head of steam and squeeze out this opportunity, and indeed for user learning and adoption. As you say, a powerful set of factors at play here that require moderation on both the design and production side of the coin. Whether the insights come early in the process or not seems less important to me than a commitment by those leading the process to search for insights (the design thinking approach) … and to recognise that insights by their very nature do not usually come when you expect them to. But, as you point out, the need to meet deadlines and move the project forward can crowd out this ambition. Its a tough challenge … clearly easier to overcome if the insights come early.